Drinkable Pinot noir under $20 is the unicorn of the wine world. 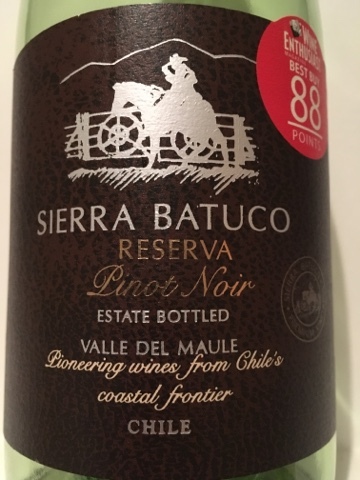 So when this $9.99 Pinot Noir from Chile was recommended to me, I almost laughed out loud. However, I am nothing if not a sucker for a bargain. Made in what I suspect is a style deliberately aimed at the American consumer, the mountain fruit in this bottle exhibits far more character than its price tag belies. Full, a bit on the cola side of dark cherry, and with all sorts of interesting spices happening, it is by no means a cerebral wine. But at this price it over delivers by a multiple factor. Definitely worth seeking out, even if it has that silly 88 point sticker on it. Bravo!